CNN initially reported Sunday that the White House Press Office intended to once again revoke Jim Acosta's press credentials at the end of the month. The White House annoucened new rules for the press corps on Tuesday, however, and said it will not will not attempt to revoke Acosta's credentials again over the Nov. 7 exchange between the president and Acosta. 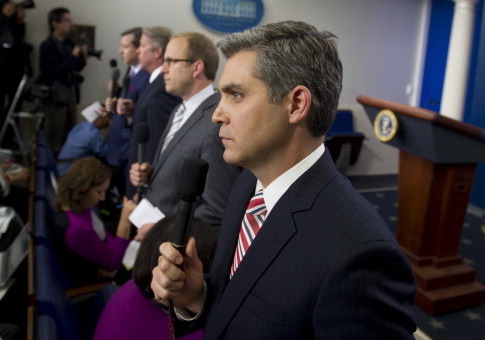 "After CNN won a temporary restraining order on Friday, forcing the White House to restore his press pass for 14 days, White House officials sent Acosta a letter stating that his pass is set to be suspended again once the restraining order expires," CNN's Brian Stetler reported late Sunday. CNN said in response to the letter that the White House is violating the Constitution. "The White House is continuing to violate the First and 5th Amendments of the Constitution. These actions threaten all journalists and news organizations. Jim Acosta and CNN will continue to report the news about the White House and the President," the network said in a statement. The White House fully restored Acosta's credentials on Monday, however, leading CNN to drop its lawsuit. The initial revocation of Acosta's press pass came after a contentious sparring match at a press conference, during which the CNN correspondent ignored President Donald Trump's repeated calls for him to sit down and allow another reporter to ask a question. In an interview with "Fox News Sunday" host Chris Wallace, Trump said that, in response to the judge's ruling that temporarily restored Acosta' press pass, the White House was working to establish rules of decorum. "We have to create rules and regulations for conduct, etc., etc. We’re doing that. We're going to write them up right now," Trump said. "It’s not a big deal. And if he [Acosta] misbehaves, we’ll throw him out, or we’ll stop the news conference." Trump signaled his support for the First Amendment and said he would consider leaving any press conference in which a reporters are acting out of line. "I will say this, look, nobody believes in the First Amendment more than I do," Trump said, "and if I think somebody is acting out of sorts, I will leave. I will say, ‘thank you very much everybody, I appreciate you coming,' and I’ll leave. And those reporters will not be too friendly to whoever it is that’s acting up." White House press secretary Sarah Huckabee Sanders on Monday issued those "rules that will govern White House press conferences going forward." Update 11/20 9:20 a.m.: This piece has been updated following a White House announcement that it would reverse its initial decision and not again revoke Jim Acosta's press pass over a contentious press conference exchange on Nov. 7. This entry was posted in Politics and tagged CNN, Donald Trump, Jim Acosta. Bookmark the permalink.